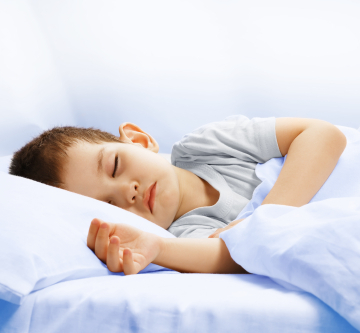 Wondering if melatonin for children is a safe and natural solution for your child's sleep problems? Although often promoted as a a natural sleep aid, it should not be your first consideration if you are looking for natural sleep aids for your child. Melatonin is actually a hormone that is secreted by the pineal gland in the brain. Melatonin secretions are at their highest in childhood and as we age the secretions become less. Children are rarely deficient in this hormone. One exception is that those with autism or in the autism spectrum may have abnormal secretions of this hormone. But for most children, giving a child melatonin supplements is not getting to the root cause of the child's sleep problems. Melatonin is necessary to set the circadian rhythm of the body, letting it know when it is time to go to sleep and when it is time to wake-up. The secretions naturally start to increase during the evening hours when there is less light, peak during the middle of the night and decline during the early morning hours. There are many lifestyle practices and natural sleep aids for children that can assist in getting the sleep that children need. In order to help the child set his "sleep clock" start to dim the lights as he/she gets ready for bed. Better yet replace bright overhead bathroom or bedroom lights, with bulbs that help promote melatonin production. Whether it's a bed stand lamp, bathroom light or night light, these special amber tinted bulbs can make all the difference in your child's quality of sleep. 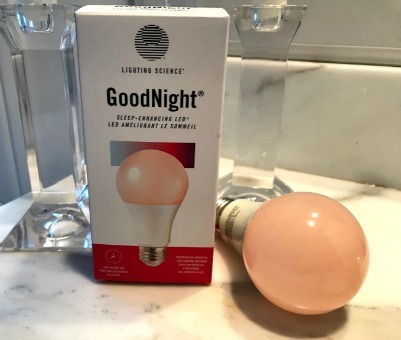 The bulbs we use in our bedrooms are by GoodNight. They give off enough light to get ready for bed without being harsh. You can feel better using these bulbs knowing that you aren't interfering with your natural circadian rhythm. The yellow lights sends the message to the brain that it is time to get ready for sleep. Bright lights send the message that it is still day time. Darkness stimulates melatonin secretions. It is helpful that the child sleeps in a dark room. Use room darkening shades, close the door, and turn off all lights when it's time for your child to go to sleep. At the same time the child needs to be exposed to bright light during daytime hours to enhance melatonin production. Sunlight and daylight help to set the circadian rhythm in children and adults. 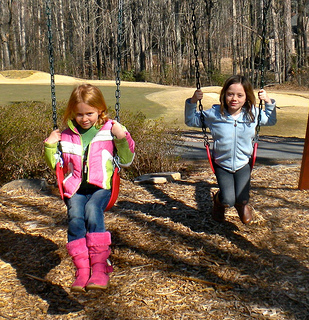 Be sure to incorporate some outdoor play everyday when possible for kids of all ages. Not only does the exposure to sunlight help with melatonin production, it helps to expend energy especially if they have been sitting in school all day. According to recent research, Richard Hansler, PhD, the author of Great Sleep! Reduced Cancer! : A Scientific Approach to Great Sleep and Reduced Cancer Risk, writes, "blue light is responsible for melatonin suppression." 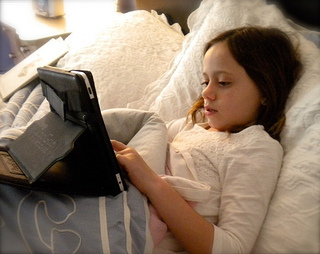 Children are exposed to blue light from their iPods, iPads, Kindles, cell phones, and TV. If your child is having trouble falling asleep or staying asleep look at their use of electronics. They may interfere with sleep by being too stimulating to some brains and by suppressing melatonin secretions. Be sure that there are no electronic devices kept in a child's bedroom. 4. Offer Organic Tart Cherry Juice Tart cherry juice is a natural way to boost melatonin levels. Most of the bottles are a concentrate - so dilute it with water. Tart cherry juice is a natural way to boost melatonin levels. Most of the bottles are a concentrate - so dilute it with water. I drink a tablespoon mixed with water every night. I had tried taking melatonin pills and they didn't help me - but the tart cherry juice helps me fall asleep quicker and stay asleep longer. Take it just before getting ready for bed, so that by the time your child is in bed, that sleepy feeling will have kicked in. Melatonin for Children - Is It Safe? "It should never be used with children younger than 18." Teaching your child good sleep habits is part of being a parent. Offering a "sleeping pill" to your child teaches them that they need a pill in order to sleep and does not address the underlying cause of his or her nighttime wakefulness. It is important to look at the root of the child's sleeping problem and make adjustments in their daytime routine, diet, exercise and stress.